Last night, we had what is becoming a quintessentially Colombian lesson in letting go: of plans, of control, of the idea that we are masters of our own destiny. It went like this: At 6pm, we went to Conversation Club at our language school, where we practice speaking painfully slowly, clearly and correctly in English to the English students (giving them a completely inaccurate idea of how English is spoken) while, in return, they gently correct our pronunciation in Spanish and gush over how easy we are to understand (although their creased brow belies their compliments). Our professor had invited us to go play soccer afterwards with he and four-year-old Victoria at James Rodriguez’s (Colombian star and international hottie) home field — a pilgrimage of sorts for our James. In my naive estadounidense way, I had figured we’d travel to the field — probably close by — play for an hour, and head home by 8:30 or so for dinner. By the end of our six months here, I imagine I will not make these sorts of assumptions. At 7pm, when our guided discussions about how we would survive if lost in the jungle ended, Robinson wasn’t there. But his friendly receptionist, Valentina, announced that she was our guide. We set off in a southerly direction, slogging through stilted cocktail conversation since our Spanish is weak, hers is fast and slangy and the buses and motorcycles lack mufflers. Several blocks and some awkward standing around later, we met up Robinson and Victoria, and put another mile under our shoes — with Jack asking when dinner is and me wondering how long we’d have to stay once we get there. The field — hallelujah! — appeared. It was beautiful and cool to see… and there was a game in process. The long-sought field was closed. But Robinson — clearly feeling like he committed to giving us a soccer field so he better deliver — shrugged and said there was another field “nearby”, and we continued on. This cycle continued. 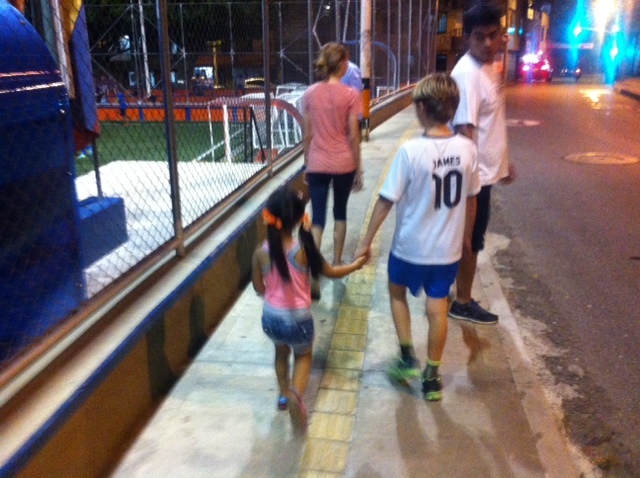 We continued heading south, and continued passing soccer fields occupied with “soccer schools.” After a brief internal struggle, I decided that this wandering is the adventure, and that it’s a great opportunity to (safely, with a guide) observe evening in working-class neighborhoods of Medellin. Because it is clear that our section of Envigado is the safety-first, Colombian-McMansion sector of this city, the Carmel Valley or Simi or maybe the outskirts of Danville. So seeing other options for la vida Colombiana — the North Park, Hollywood or Rockridge, if you will — was fascinating: Young men in pairs or threesomes on BMX-like bikes. Wide avenues full of exhaust, taxis, buses, motos and life-threatening street crossings. Long, dark residential streets with couples out walking their dogs and little kids on scooters. Small neighborhood stores and restaurants with old men and couples and families out front. Parks full of women with water bottles and gym towels under their arms, clearly just finishing some sort of class. * Two roller derby tracks; it’s apparently a big sport for girls here. 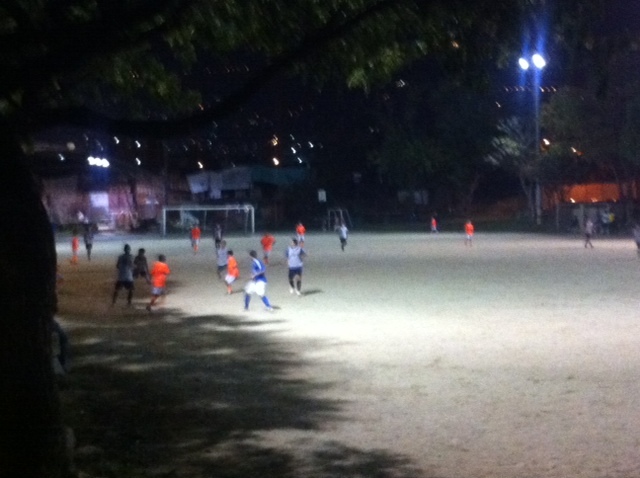 About 8:40, when in my linear, American way I’d assumed we’d be home for dinner, we arrived at Envigado’s version of Robb Field, with games, drills, and exercises for teams of all ages and skill levels in process. But nary an open fields. So Eric and I watched some boys about Jack’s age play for while, trying to assess his relative skill level, and the kids entertained Victoria on the playground. Then we caught a taxi home and had dinner just before 10. * All over this city, in parks, next to schools, at intersections, in all neighborhoods, there are weather-proof exercise machines — bench weights, shoulder presses, stationary bikes, etc. There is literally no excuse for letting a diet of meat and more meat make you unhealthy. PS Yes, that last photo is unrelated but it’s fun, right? First off I want to clear the air with my mom’s posts on teenage-hood and with my brother. What I don’t get is that I am not even a teenager yet and she is already been shocked out of her socks about what is going to happen to me. I get it, I get it, it makes a good story and she’s my mom but still… About my brother: I have never (recently) uttered the ill-disposed, rhetorical, and futile remark, “Why is he so annoying?” What I actually say is, “Being obnoxious gets him nowhere except for infuriating me and what does that do for him in life except bringing a little pleasure to know he has finally beaten me in life (which deep down he knows isn’t true)?” And that gets me wondering, “What did my dad have for breakfast?” and “Passwords. Why are there passwords? Has anyone ever read Harry Potter (the Neville part)?” after many subtle subject changes (because in Colombia I have time to ponder). Colombia has so far been a great break from melodramatic 7th grade. Many people my age tend to feel like crushes are a big secret. Crushes (in real life) are saved only for celebrities. In reality, when you like someone, you go ahead and say it or ask them for coffee (or ask if they go to the dance with you) or something, not keep it to yourself. And if it’s “a really big crush” do you really think it’s hidden from everybody? Also who cares if you know who someone’s crush is? Don’t you think if they wanted you to know, they would have told you? Why do people act like this? Doesn’t it get in the way of so many other thoughts or emotions? Love? What is it exactly? Even if you have experienced love does that mean you truly understand it? Definitely not all aspects of it, surely? Sorry, back on track. Colombia. We have had many great experiences so far, that you’ve probably heard of. One just recently was trekking approximately 1,618,033,988.7 miles to a supposed soccer field at night. Of course only to realize they were full and then play on a miniscule playground until, 5 minutes later, we had to go because of certain people’s vacant stomachs. All through this I am thinking that this could have been a great experience if there existed in this world an inexpensive, logical: “Are you walking to work but bored by the identical sights!? Are your parents telling you to walk eternally!? With our device you can safely walk anywhere while reading your book.” Ah, Right. They’ve already invented that; it’s called Audio books. But it is not inexpensive and logical and then I would miss all the good experiences. No, strike that. But then I would miss all the experiences whether good or bad. My experience with Colombia has been a great one so far. My only problem at the moment is communication. Well, and that when I get back to the US all the Spanish there is Mexican Spanish (which people call “a different slang” but really it is just a whole other language). For more information on that confusing subject, watch this Youtube video. Oh, How Hard it is to Speak Spanish.